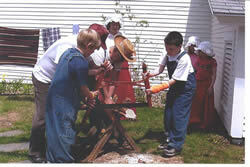 Each May, Thompson-Ames Historical Society offers field trip experiences to Gilford’s third graders as part of their studies of local history. In June the Society members enjoy receiving from the students various expressions of appreciation -- thank you notes, cards with drawings, posters -- that show every student’s originality. It is interesting to learn what has made a special impression on each individual student. We thought we’d share this small sampling with you. I liked when we tried to cut the wood with the saw. It was fun when we dressed up like the people from the olden days. The overalls were comfortable. Thank you for everything. I really loved making the quilts for sick babies. I also liked the store because it seemed like a cool store. I also liked everything else. Thank you for making our field trip really exciting. I loved writing with the quill pens. I liked the steel pen, too. In the toy area, my favorite toys were the climbing bear, the Whimmy Diddle and the yo-yo. The school area was fun, too. I liked the old fashioned desks and chairs. The old books were really cool, too. I liked everything in the military area. Thank you. Our field trip was EXCELLENT! Each student in one class sent us a large colorful poster depicting what they liked most at the Grange, Meetinghouse and Rowe House. Here are some excerpts about the Rowe House (unfortunately minus the pictures). At the Rowe House I learned that they had a cool record player that played music. I liked that. At the Rowe House I learned that they had beds made out of straw. At the Rowe House I really liked spinning the butter churner and listening to the record player. At the Rowe House I learned that they had a fireplace in every room to heat the house. My favorite part here was the dining room because I learned that the trees outside in front of the cemetery are to cover up a boy’s grave. Kathy Lacroix, Thompson-Ames Historical Society’s Education Coordinator, is quick to express appreciation to all the volunteers who make the third grade field trips possible. This year’s thanks go to Carol Anderson, Terry Bobseine, Mary Chesebrough, Jim Colby, Mary and Don Frost, Gerald Knight, Kathy and Jerry Lacroix, Sue Maupin, Elizabeth Mead, Monica and Steve Melbourne, Diane Mitton, Yvette Johnson, Priscilla Puleo, and Stan Piper. Four of these were new this year; as an introduction, each new volunteer received a descriptive paper and also “shadowed” an experienced docent. More and more volunteers are needed to assure that these T-AHS’s field trip experiences can be continued. If you are interested in learning more, contact Kathy Lacroix by e-mail at xteachkL@metrocast.net or by phone at 524-3390.